On a blistering September afternoon a few days before the start of classes, around half of the Class of 2021 is sitting in Spaulding Auditorium. The faces on stage are serious. “How many of you were the valedictorian at your high school?” one of them asks. Hands go up into the air, too many to count. Reality comes crashing down on the shoulders of hundreds of nervous first-years. As they file out of the auditorium 20 minutes later, one student turns to her friend. “Guess I peaked in high school,” she says. They laugh nervously. No matter their high school background, Dartmouth students all came from situations wherein they excelled. If they hadn’t, they wouldn’t have landed a coveted spot at the College. Excelling in their respective communities looked different for each one, given the size of their school or town and the amount of resources it had. For some, they might have had a lot of college counseling and attended top-tier institutions alongside 10 or 15 other students. Some may have come from tiny, remote towns that had never sent a student to an Ivy League school before. The specifics of success differed for each student, whether it was getting that perfect SAT score, setting a state record in the 800 meters or logging more volunteer hours than there are hours in a day. But all were success stories. Still, the joking “I think I peaked in high school” line is tossed about among these objectively successful people, especially around midterms and finals. It is heard in the KAF line, it is heard on the Green. Perhaps it is a sign that, as a collective group, Dartmouth students are unaccustomed to failure. This phrase may be a defense mechanism pulled out at the first sign of hardship, to assume that the best of our days is surely behind us. A seemingly harmless joke is a thinly-veiled sign of a very real insecurity. Of course Dartmouth students are afraid of failure — the only way to get to the College is to be so terrified of failure that there is no choice but to succeed. Hopefully, though, by addressing the psychological strains that this pressure places on them, students might finally begin to move past their fear. Students are in control of whether they “peaked in high school.” If one is uncomfortable with the suspicion that high school football games, AP Biology and senior prom might be the highlights of one’s life, then one must make new highlights. Be more of oneself, whatever that means in each individual case. The former star of the high school concert band should take music theory courses with some of the best musicians and professors in the country, not just continue to practice the oboe in their dorm room with the door closed. The student majoring in something they do not enjoy should at least minor in that subject that their high school teacher always wanted to see them explore more. The stage manager of the high school musicals, always dreaming of the spotlight, should audition for a production instead of assuming they won’t measure up to the high standards of college theater. The time for sitting quietly on one’s passions is over — if Dartmouth is not the place to explore them boldly, then where is? There are opportunities to build upon the successes of high school, rather than resting upon a security that “I already know who I am.” Evolution is the only way to combat hindsight’s rose-colored glasses. Students should not be faulted for harboring the fear that has been instilled in them for years, but they can be faulted for allowing that fear to prevent them from continuing to grow and capitalize on the wealth of opportunities that the College has to offer. That fateful day in the Spaulding Auditorium, incoming first-years were scared that they wouldn’t measure up among incredibly stiff competition, and their fears of failure were only reaffirmed. 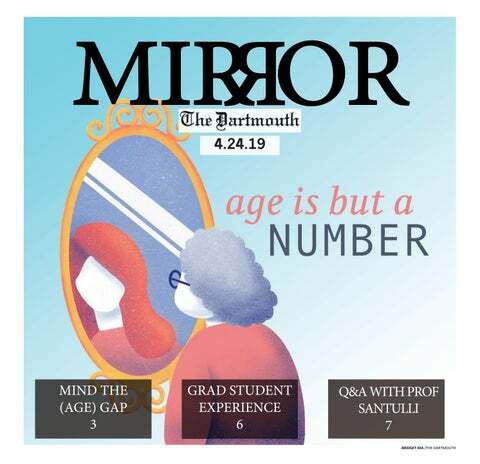 Dartmouth does not use that fear of failure to fuel a cutthroat competitive environment that many peer institutions have struggled to shake, but it is still a very real phenomenon that must be treated with sincerity. If one is not careful, “I might have peaked in high school” will be a reality rather than just a joke.